Seared Scallops over Pumpkin Butternut Squash Puree. 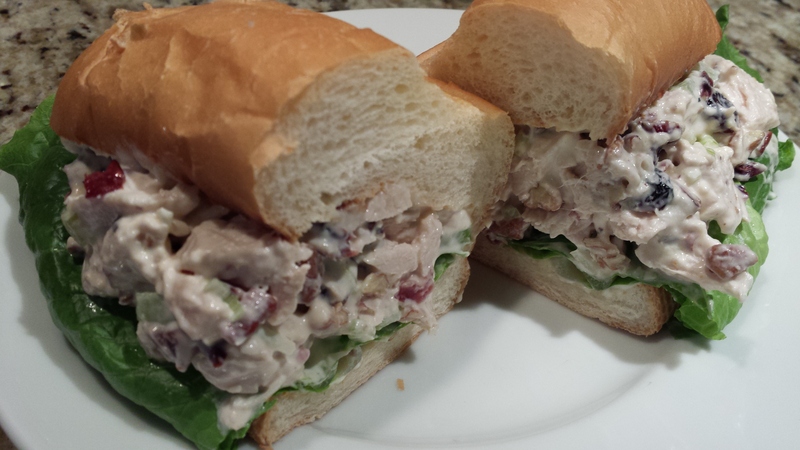 Add some fresh sage, dried cranberries, toasted pecans, crumbled bacon bits, and a lovely Calvados sauce. 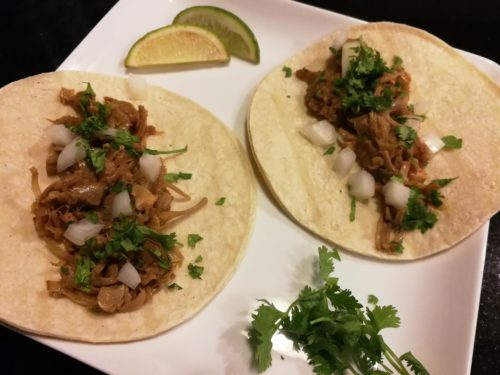 Serve with a pinot noir or sauvignon blanc wine or hard apple cider. What an exciting combination for a lovely Autumn dinner! My husband purchased some fresh scallops recently at our local Costco. Wow, can anyone tell me why scallops and shrimp are so expensive these days? The cost was about $1 per scallop by the time I pulled the 15 “whole” scallops out of the 7 “pieces” that were left. Ridiculous. But a treat nevertheless. 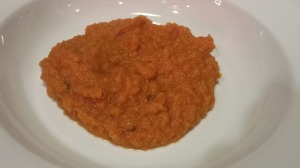 I like to use a pumpkin puree in this dish, along with the butternut squash puree. You can buy frozen or fresh butternut squash puree. Or you can make your own by cooking peeled and seeded diced squash until tender. 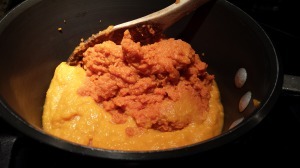 Puree with a hand blender or in a regular blender before heating. I have a Bamix hand blender that produces very silky purees. 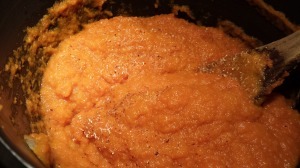 Additionally, I use a Cuisinart hand blender for a more rustic-looking puree. 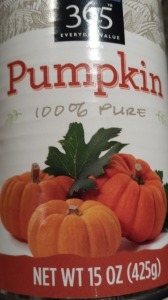 Whole Foods Market carries a nice canned pumpkin puree and also an organic version. 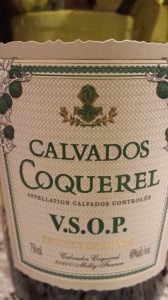 Calvados is an apple brandy from France. 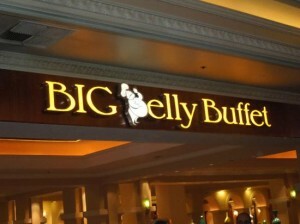 You can substitute regular brandy in this dish. Rinse the scallops well and then put them into a bowl of ice and water and set aside. 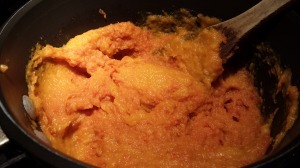 Mix together pumpkin and butternut squash purees in a pan. Stir and warm the puree. Add some seafood stock to the puree for some depth. 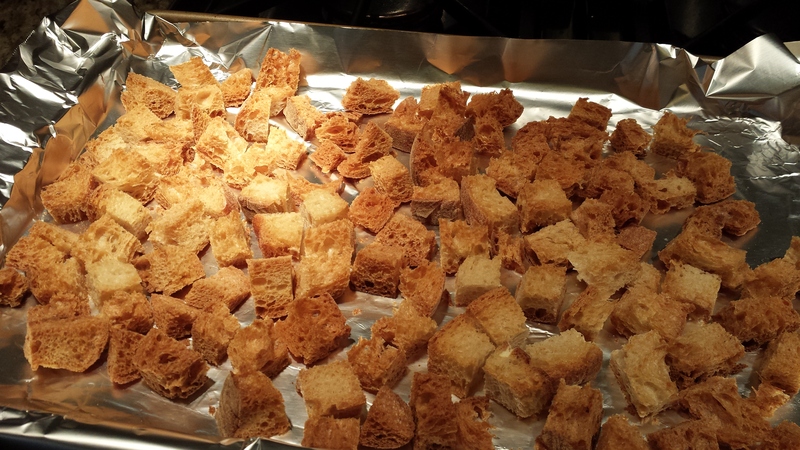 When the puree has warmed through, add some fresh finely chopped sage, grated nutmeg, and ground cinnamon. Stir in some butter, season with salt and pepper, and then keep warm. In a sauce pan, melt some butter. Add some seafood stock and bring to a simmer. Add some Calvados and honey and let simmer until the sauce reduces somewhat. Set aside and keep warm. 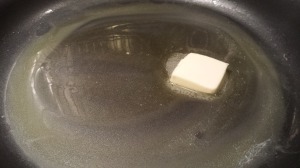 In a non-stick pan, melt some butter over medium heat. Rinse, drain, and then dry the scallops with some paper towels. Sprinkle a bit of salt on the scallops. 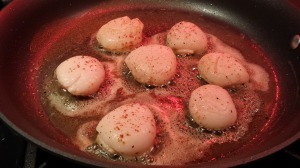 Sear the scallops in the butter on each side until they are golden brown. Remove the scallops to a plate and keep warm. Transfer the Calvados sauce to the scallops pan. Heat through. Return the scallops to the pan and simmer the scallops for a minute in the Calvados sauce. To plate, spoon some of the pumpkin butternut squash puree amongst your serving dishes. 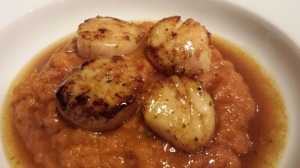 Arrange the scallops over the puree. Ladle some of the Calvados sauce over the scallops. 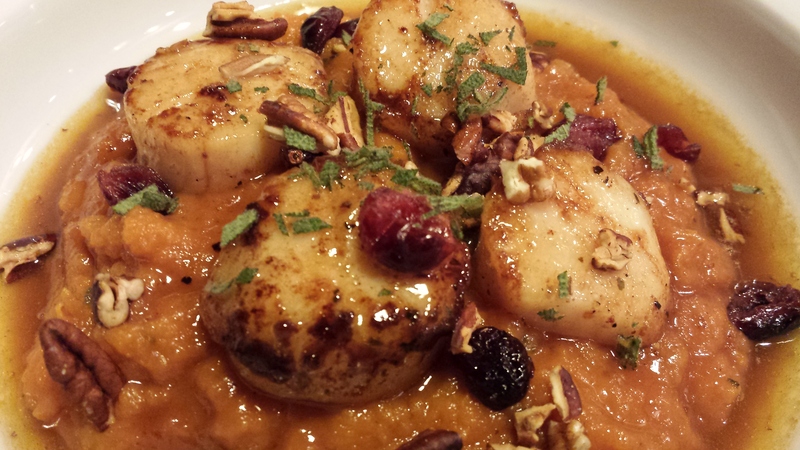 Garnish the scallops with the toasted pecans, dried cranberries, fresh sage, and crumbled bacon. 1. Rinse the scallops in cold water to remove sand and debris. 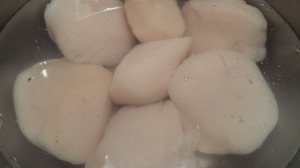 Set scallops aside in a bowl filled with ice water until ready to use. 2. 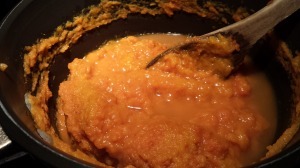 In a medium saucepan, heat the pumpkin and butternut squash purees. Add the seafood stock, cinnamon, nutmeg and sage and cook over medium low heat. Add 2T butter and stir until butter is melted. Season with salt and pepper. Keep warm over low heat. 3. In a medium saucepan, over low heat, melt the 1 T butter. Add the seafood stock and let simmer a few minutes over medium heat. 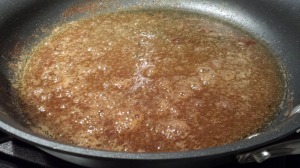 Add the Calvados and the honey and stir. Let the sauce reduce and thicken a bit. Set aside and keep warm. 4. Rinse and drain the scallops and pat them dry with paper towels. Sprinkle each scallop with some salt. 5. In a non-stick saute pan, melt 2 T butter for the scallops. Sear the scallops on each side until golden brown. Do not overcook the scallops or they will become tough. Remove the scallops from the pan to a plate and keep warm. 6. 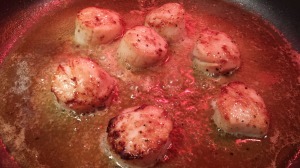 Add the Calvados sauce to the scallops pan and bring to a simmer. Return the scallops to the pan. Warm through. 7. To plate, divide the spiced pumpkin butternut squash puree amongst your serving dishes. Divide the scallops amongst the serving dishes and arrange on top of the puree. Ladle some of the Calvados sauce over the scallops. 8. 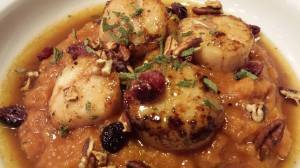 To garnish, sprinkle the cranberries, pecans, sage, and bacon over the scallops and puree. Serves 2 as a main course with 4 scallops each, serves 4 as a light fish course with 2 scallops each, or serves 8 as an appetizer or amuse bouche with one scallop each. Serve with a sauvignon blanc or a pinot noir wine. Hard apple cider is a good choice for this dish. As a salad accompaniment, my Roasted Beet Salad with Goat Cheese and Pine Nuts or my Pretty Pear Salad with Goat Cheese and Cinnamon Pecans pair well with this dish. Variations: This recipe works well with seared shrimp or even a seared piece of white fish. 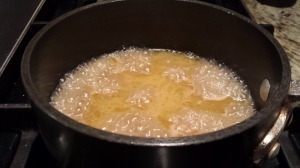 Alternately, use a seared cooked boneless chicken breast and swap out the seafood stock for some chicken stock. Substitute regular brandy for the Calvados. Omit the nuts if anyone has nut allergies. You could substitute raisins or currants for the dried cranberries. And you could add a touch of cream to the pumpkin butternut squash puree for additional decadence. Get your own best-selling hand blender in assorted colors at Amazon.com .